"univativ Group, as one of the market leaders in German speaking Europe, has been building its current presence over the last 20 years. This transaction is an important milestone, enabling us to continue with our strategic efforts. 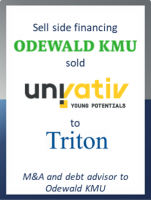 We welcome Triton as a new majority owner and a respected investor who will support us in developing innovative services and executing our plans for further expanding our market positions,” said Martin Ilg, Henning Loof and Olaf Kempin, who are the founders and Managing Directors of univativ.